Worlds of Wonder has been a go-to destination for people seeking fun in Delhi NCR since many years. Located in the hustle and bustle of the town, this unspoiled site overlooking the city has been transformed significantly over the past few years, making it into one of India’s greatest amusement and water parks featuring rides and attractions which are a wonderful fit for people across all age groups. The amusement park has more than 20 fantastically created and placed rides and attractions ensuring that you have the time of your life with your family and friends. It matches international safety standards offering everything you want. Along with the classic rides, it also offers the modern thrillers. You can test your skills at the many exciting games and enjoy shopping at the souvenir shops. The amusement park features two zones - Roadshow and La Fiesta, with some of the most innovative rides and attractions. It has dedicated rides for kids keeping their safety requirements in mind and remains an enchanted oasis of family fun which consistently delivers. 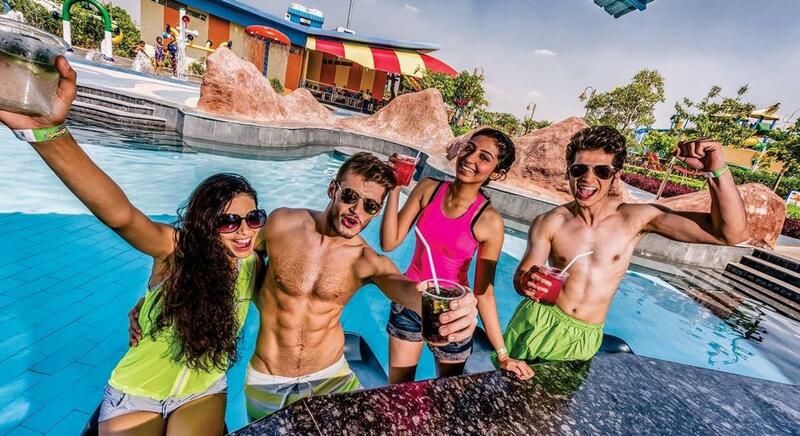 The water park pays homage to the traditional hues, making it an ideal destination to beat the heat. The park offers splashtacular water fun in a breathtaking tropical atmosphere. You will find a number of rides to indulge in some summer fun. The park offers the guests a variety of up-close experiences such as thrilling rides, a splendid gaming zone, Worlds of Wonder offers and a spectacular water park. There are a number of eateries providing multi-cuisines making you stay energized all day long. It houses 20 TUV Nord certified rides, 26 world class slides, the largest go-karting track in North India, a huge man-made lake for an exquisite boating experience and a beach themed wave pool. Ticket is non-refundable and non-transferable. If the ticket is altered/tempered or exchanged, it would be cancelled. It may be possible that one or more rides may not be operational for reasons beyond Worlds of Wonder's control, request you to bear with them and enjoy other rides instead. No refund will be made under such circumstances. Please do not try to remove/transfer/tamper/disfigure or mutilate the wristband. Doing so will disqualify you from taking the rides even if you possess a valid ticket. Bringing food or alcoholic beverages from outside into Worlds of Wonder is strictly prohibited. Worlds of Wonder reserves the right to deny admission or ask a person already admitted to leave the premises, for failure to comply with any of the Worlds of Wonder rules, or for unsafe, illegal or offensive behaviours. Person under the influence of alcohol will not be permitted inside Worlds of Wonder. Entry is free for children below the height of 90 cms, only if accompanied by adults. They will not be permitted on the rides. Height and weight regulation must be followed as per safety norms of each ride. Visitor wearing sarees/lungi are not allowed on Feedback, Fast Forward, Big Beat, Rockin Roller and Go Karting due to safety reasons. Bags/carry bags are not allowed inside Worlds of Wonder. Guests are requested to take care of their belongings. The management will not be responsible for any loss of articles. Entry to Worlds of Wonder will close one hour before the closing time of the park. Weapons, pets, cigarettes and other tobacco products are not allowed inside the park. Worlds of Wonder is a non-smoking zone. Children should be accompanied with the elders. Wearing the band implies guest’s acceptance and adherence to above mentioned rules and regulation. Please wear appropriate swimming attire, recommended for water sports, i.e., nylon/lycra fabric. It is mandatory to wear swimming costume before getting stepping into the water. Costumes should not have any rivets, metal buckles or metal ornamentation. Do not wear any loose clothing, jewellery, watch, necklace, ornament or ring while using the rides. This may cause their loss and injury to you. Kindly read and obey all posted signs. Please obey all instructions given by attendants and operators. Outside food/beverages and alcoholic beverages are prohibited. Worlds of Wonder - Water Park is a non-smoking zone. Anyone under the influence of alcohol or drugs will not be permitted inside the Worlds of Wonder - Water Park premises. Please note that you are sliding and using the equipment at your own risk. Lockers and costumes are available on rent. Worlds of Wonder management will not be responsible for any loss of articles. To enjoy the rides at the Worlds of Wonder - Water Park, please retain your ticket till you exit. Footwear is not allowed on any of the rides and slides of the water park. Management reserves the right to deny admission or to ask anyone to leave the premises in case of failure to comply with the rules & regulations of Worlds of Wonder - Water Park. Weapons, pets and cigarettes/tobacco products are not permitted inside Worlds of Wonder - Water Park. Entry to Worlds of Wonder - Water Park will close one hour before the closing time. Tickets are non- refundable, non-transferable and valid on the date of issue for one-time entry only. If the ticket is altered/ tampered/ exchanged, it would be cancelled. Buying of ticket implies acceptance and adherence to above- mentioned rules and regulations. Drivers must follow the instructions provided by the staff for a safe driving experience. Drivers must wear appropriate clothes and shoes while driving. Inappropriate clothing may get caught up in rotating parts of the karts and could result in severe injuries. A full face helmet is mandatory while driving for your own safety. Drivers must keep any long hair tucked inside before wearing the helmet. Untied/open/ loose hair strands may get caught in the rotating parts of the kart, resulting in severe injuries. Driving karts is prohibited under the influence of alcohol and drugs. Do not drive if you have any heart or nervous disorders. Drivers must not drive in a reckless manner which could endanger the other drivers. Do not bump another kart while driving to avoid accidents and injuries. The management will not be responsible for any accidents that happen when karts bump into each other. Drivers must slow down when yellow flags are waived. Yellow flags are there to prevent accidents on the track. Drivers must follow and comply with all the rules and directives of Wonder Speedway. Drivers must not get out of their Go karts for any reason while on track, without track staff permission. If stuck at the track, please wave your hands over your head, and wait for the track staff to intervene. The track management has the right to exclude anybody who doesn’t respect the rules and regulations or drives in a dangerous manner. Refunds in such cases will not be entertained. Drivers are responsible for their own belongings. The management will not be responsible for losses and damages to any of driver’s belongings. Drivers will be held responsible for any damages incurred on and to the track property by them as per Wonder Speedway’s pre-determined cost list. In case of rain, fog or unsuitable weather conditions, drivers must slow down and drive carefully to avoid bumping other karts or the track partitions. The driver shall not ask for any refund if they decide to abort their driving session. In case the management decides to abort race in middle due to unfavourable weather conditions, the race will be started as soon as possible, but drivers will not be given any refunds in such cases. All refunds and cancellations will be at the discretion of the Wonder Speedway management.